After another multi-year hiatus, can't believe it's been so long since I've had the bike running, I am back with a new project. Any of the older members still around? 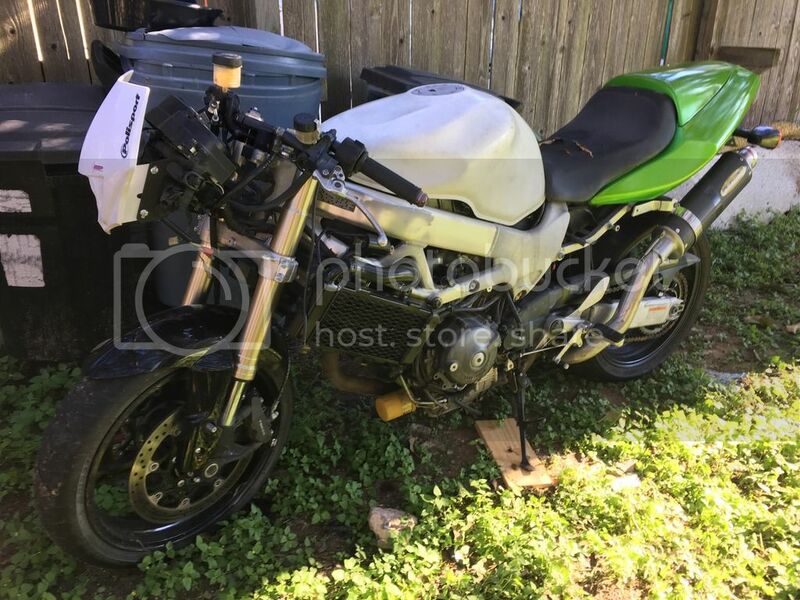 First bought the bike at the end of July/beginning of August 2009, had bright green fairings from the previous owner. Ended up riding the bike from San Jose, CA to Austin, TX. That was an adventure I'll never repeat on a sport bike. In October of 2009 I started the infamous SuMoHawk, see it here, which was quite interesting. 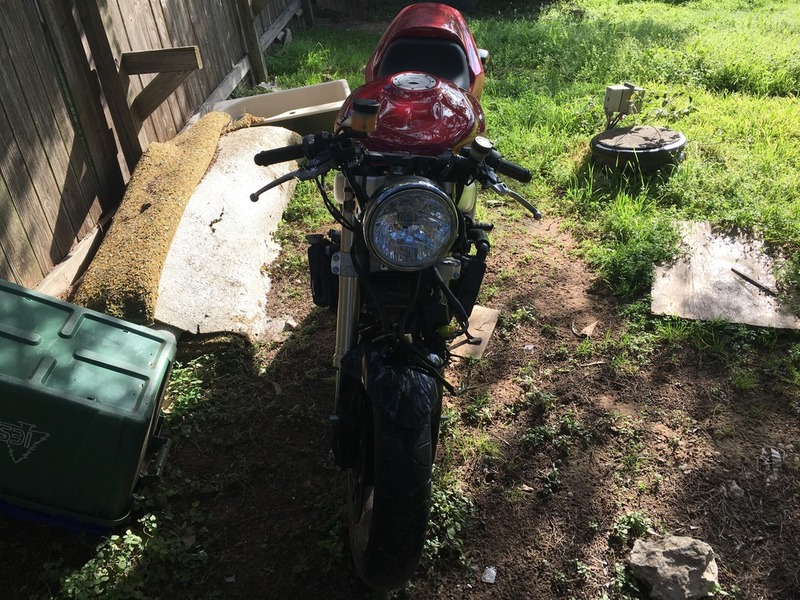 The pictures are down, but it essentially involved me having swapped in dirt bike forks and done a single-sided brake conversion, as well as painting the tank white and mounting a supermoto headlight. I did actually take it offroading several time, which was entertaining, but in the end I grew bored of it and swapped it back. In January of 2010, I joined the Air Force and was entirely out of the motorcycle scene due to BMT and 4N0 training. Superhawk had to sit at this point, so fuel treatment goes into the tank and into storage it goes. In July of 2010 I bought a Husqvarna SM610 to complete the supermoto quest. That bike was a blast and I was sad when I finally sold it in 2013, but I didn't have time to ride it. Fast-forward to January of 2011, with another project that can be seen here, where I finally managed to pick up the Superhawk out of storage. At that point it had been sitting for an entire year, but it still ran. 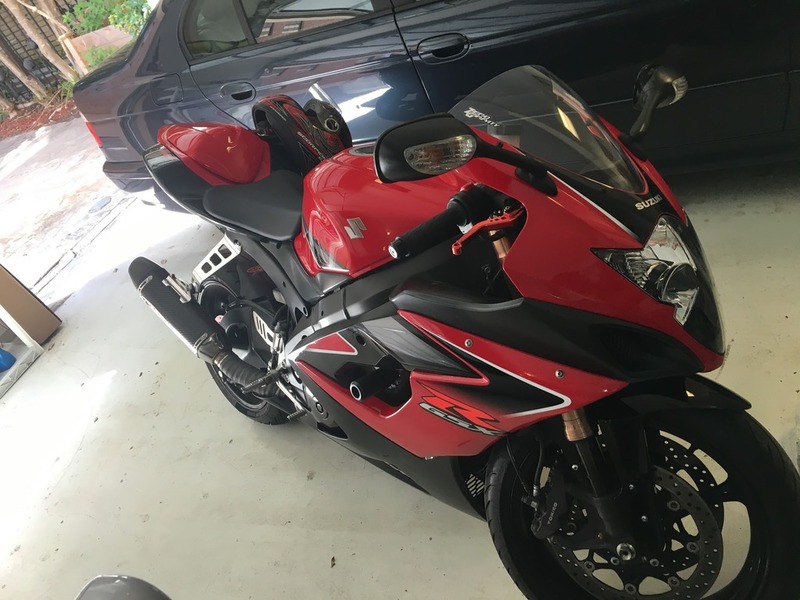 It also still had all the fairings, along with a plethora of colors, and I had decided to try to swap a GSX-R tail fairing and GSX-R forks. Well the forks were easy, and they reside on the bike now, but the tail was not. That is a project that would require a welder that I didn't possess at the time, so the tail fairing idea was abandoned. Due to registration issues I wasn't able to ride the Superhawk, but by sheer coincidence my friend had just bought himself a brand new 2011 ZX6R and had stopped riding the crashed Superhawk that he had previously purchased. Thus, a group of us got the poor thing running and swapped all my good parts(fairings, headlight, shifter, mirror) onto the crashed one and I started riding that. It was all good until he crashed the ZX6R and took over the now-running Superhawk, and as it was his only transportation, I let him keep riding with my parts. Meanwhile, my poor bike keeps sitting. Fast-forward another year to February of 2012, another thread was created, I had finally gotten the rider's itch again. I pulled the Superhawk out of storage and managed to coax it out of its slumber with a jump and a lot of persuasion. Keep in mind that the fuel in the tank is still from December 2009, yet it still came to life. Kudos to the fuel stabilizer that kept the carbs from gumming up. It was at this point that I decided to hit my friend up so that I could get my parts back, I wanted to ride a complete bike after all. Sadly, letting someone have your parts for a long time makes it harder to get back. Then, tragedy strikes. Only three days after I get her started and try to get my stuff back, I find out my friend has died. This is very depressing for me and instantly kills my desire to do anything with my bike, so it sits in a forlorn state. October of 2015, over three years later, I make the mistake of riding a friend's new Z1000. The riding itch is back. Oh my. November of 2015, I finally go through the motions of pulling the carbs and cleaning them (I was also reminded of how much I despise those large springs). Remember, though, that this bike holds a lot of bad memories for me. 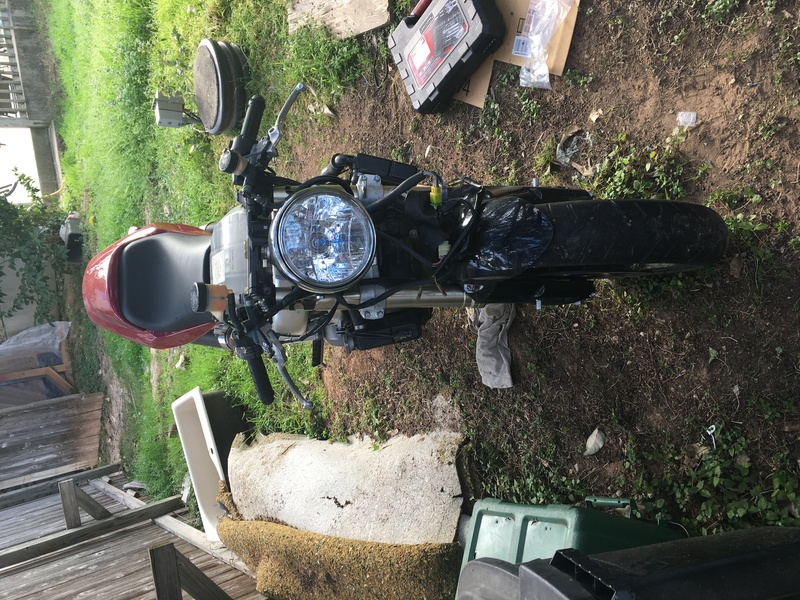 It's in ragged shape with a green rear fairing and a white tank(that's scratched due to my half-*** initial paint job), missing the front fairing and shifter due to my friend's accident, the seat cover is torn, and it's a constant reminder of my friend's passing. 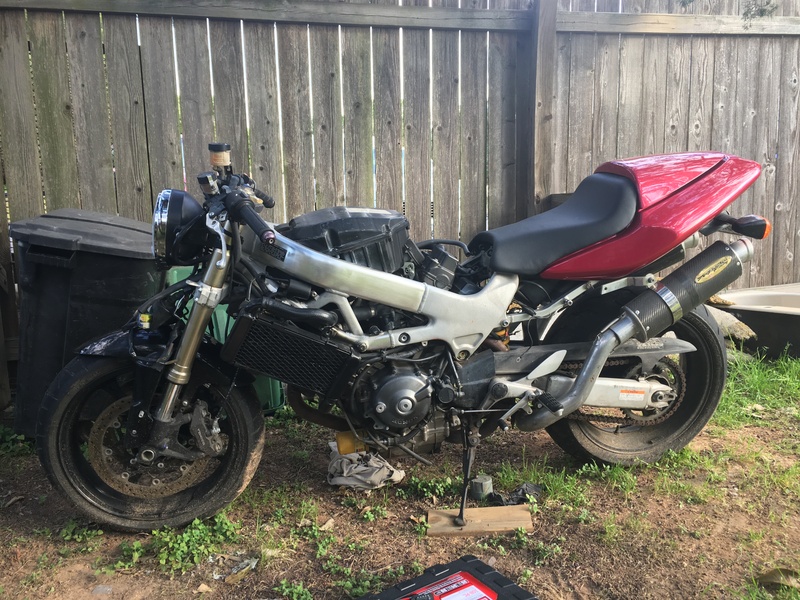 I decided, now that it's running, to list it on CL as-is in a hope to simply get rid of it for $1,100(since it does have a full gsx-r front end) so that I can get something different and not be reminded of the past. Big mistake. 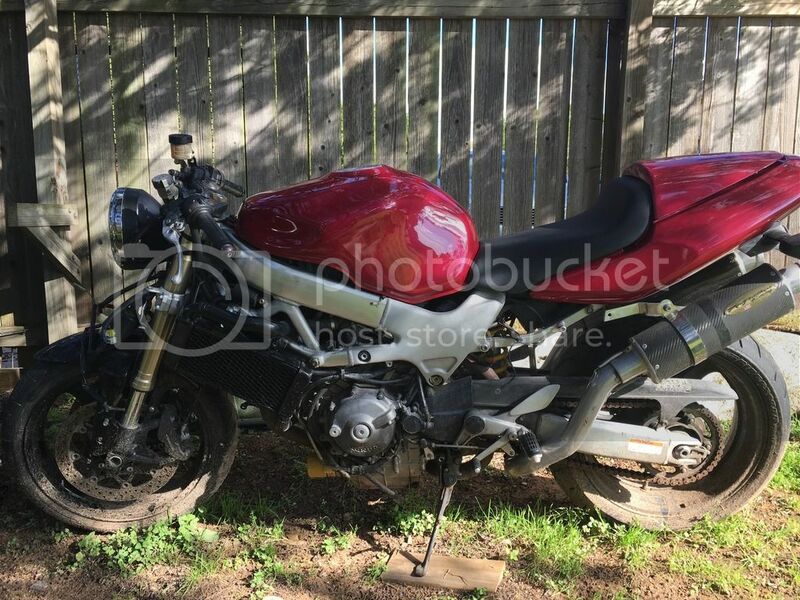 The lower the price of your bike, the more atrocious the low-ballers become. After being told that my bike was "obviously in a huge accident and the frame must also be compromised" by someone who hadn't so much as seen the bike in person and was using that poor assumption to lowball me(it's never been in a wreck, I don't even believe it's been dropped), I finally pulled the ad and decided to fix the bike up. Make her look like a Superhawk. I also rode her for the first time since the forks were swapped. Wow, what a difference. They're so stiff and the brakes are ridiculous compared to the stock setup. No more fork dive and extreme brake lever travel. This poor bike has traveled thousands of miles both on her own two wheels and in the back of moving vans. Now comes the tricky part of cleaning her up so I can have better memories. *Obtain fairings or do a streetfighter conversion that doesn't look terrible like the current one. If I get fairings, I will also need a fairing/speedo bracket, all the fairing brackets, etc. It may even be easier to do a CBR conversion, since the Superhawk fairings are so difficult to come by. *Re-cover the seat. This is actually in progress, I am letting the foam repairs set overnight and will be covering it tomorrow. Pictures will be posted here. *Obtain front and rear turn signals. Once she's looking pretty I'll reassess if I should keep her or not. Last edited by Just_Nick; 11-29-2015 at 07:41 AM. That's a tale and a half. Fix her up and get riding. If you have the budget (lots of $100 bills) replace all the parts to bring it back to stock. I suggest this because (for me) a street fighter build is just more than I care (maybe capable of) to do right. 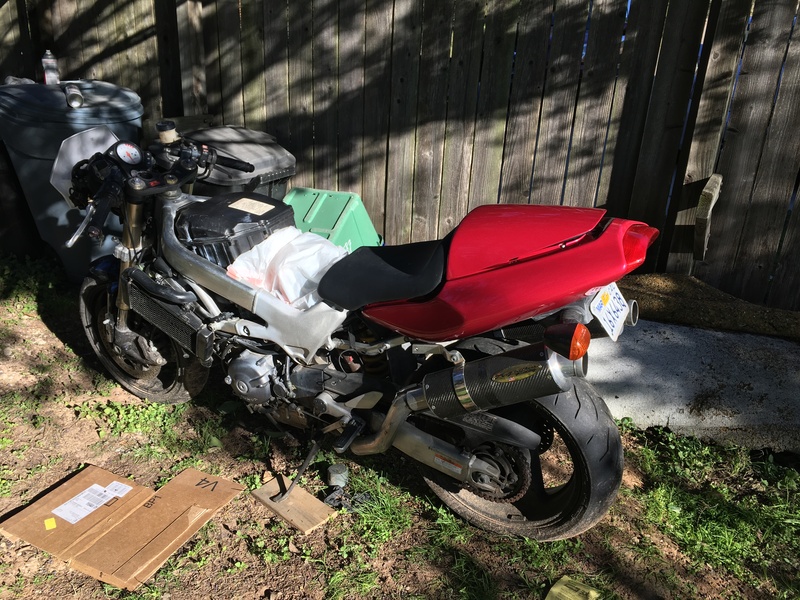 You might consider parting out the bike, take the money and find a clean, unmolested SH. Or put the cash down on a new/used Triumph street triple R or Rx. I'm already looking for a 2005-2006 liter bike, so it's likely that this one will simply become funding for that. At this moment I have little desire to keep it. 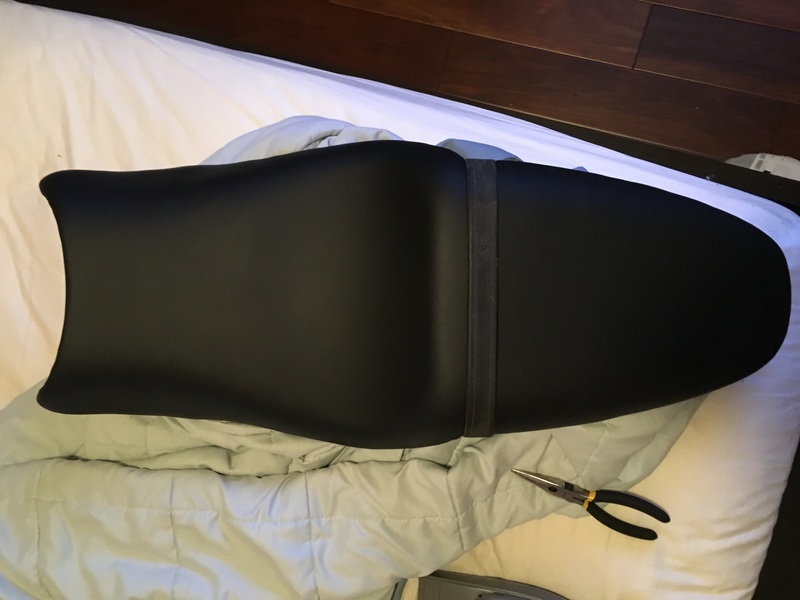 Final results of the re-covered seat. Where did you source the the cover material from? Looks to be a fine grain surface like the stock seat. Hancock Fabrics. Staples are 1/4". However, unless you plan on sewing the material, I recommend just buying a pre-made cover. The shape of the front and rear are difficult to navigate and require quite a bit of time to make it as close to perfect as possible. That being said, a manual and even an electric staple gun were not strong enough to penetrate the plastic fully and required me to press every staple in the rest of the way with pliers. I'd highly recommend using a pneumatic staple gun. Is this the same as what you used? Negative, I only paid $5.00 for a yard. There is no brand or anything on the back. All I see is a circle within a circle with some numbering that's too light to make out. Just find something with a bit of stretch and that has texture you like. Last edited by Just_Nick; 12-06-2015 at 07:36 PM. 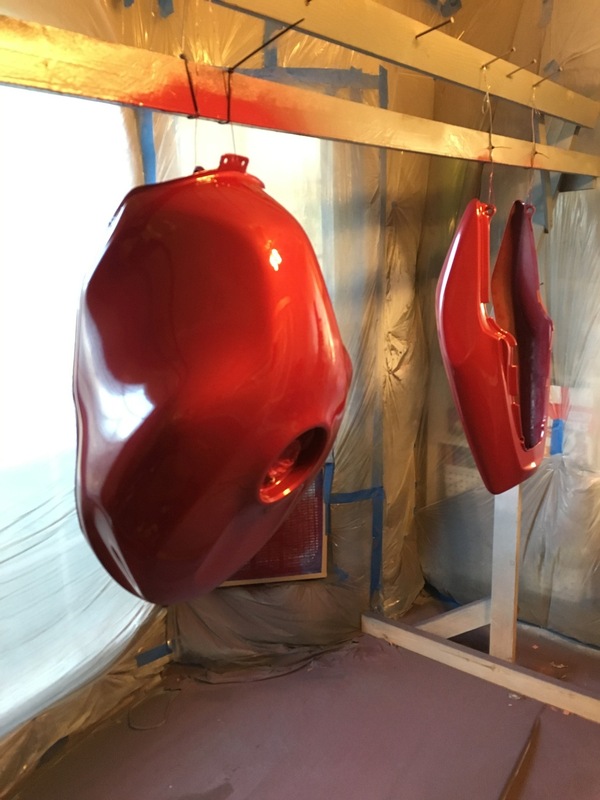 No pictures right now, but the tank, rear fairing, and seat cowl are all primed and ready for me to spray them. About 10 years ago a friend loaned me an Air stapler to recover a seat.. previously I had been using what is billed as a heavy duty one from Stanley.. Night and day difference. I bought an air stapler that week and have not looked back.. I've done dozens of seat covers now, mostly dirt bikes but a few street as well...Do get a regulator for the airline...as some seat pans are softer or thinner than others.. If you have air pressure set too high it cuts the fabric, if too low, the staple does not go flush. Before I start on the new cover, I take a test swatch of fabric and staple it to the seat pan to get the pressure right for that seat. I used a short "whip" to install the regulator and gauge. After installing the seat cover, I use a marker to write the seat model and pressure used inside the stapler storage case for use next time. 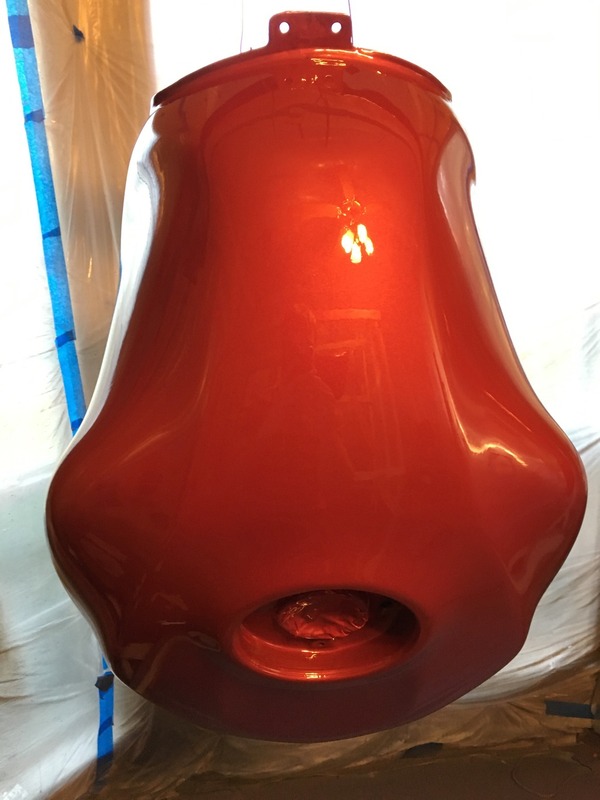 Obviously it will still need to be polished to get out imperfections, but it should soon be mounted. Note that in the second picture you can see me reflected within the paint. Fairly impressive, considering that it hasn't even been touched up at all. The lighting and camera make it look slightly orange, but it is red with light metallic flaking. Last edited by Just_Nick; 01-24-2016 at 04:13 PM. I like your spray booth. How is the rest of the bike coming along? Right now I'm trying to decide on a headlight setup. I want something that I can use to hide all the wiring. Then I will make a dash mount such that it's above the headlight, similar to how the FZ1 naked version does it. Last edited by Just_Nick; 02-06-2016 at 03:31 PM. Nice to have you back on, but is it temporary? Did I understand right? Are you building this bike to sell and get something else? After all you two have meant to each other? We'll see how I feel once I have her up-and-running. So far I haven't found much, despite actively looking, so at least I'll have something to ride as I look. In spite of that, I would prefer to get rid of it precisely because of the history and the bad memories that it evokes. But who knows, maybe I'll fall back in love after riding it again, enough to put aside my memories. Still can't believe it's been almost seven years since I bought the bike, though. Crazy how time flies by. 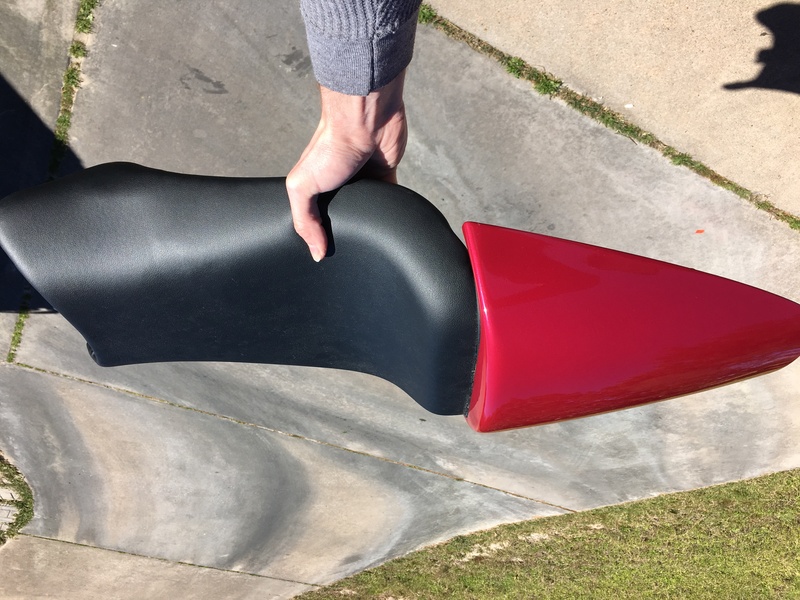 Is there a tab that goes under the rear of the seat on your single seat cowl? There is on mine at the rear and one on either side at the front. If the one at the rear on yours is missing you could make a bracket to hold it snug against the rear of the seat! Oh, and by the way , glad to see you have the fastest Color. Negative, mine is broken off. I'm going to have to fashion something to secure it. Keep going mate, so far a big improvement. Tank is on there to prevent stuff from falling in, but it's significantly better looking now. Starting to look like a bike again! Suzuki fairings on a VTR! Yeah that should be interesting to make that fit. I just did a transplant of Ducati 1098 bodywork onto my ninja 650. Takes a lot of careful fitting testing and cutting. Show us the results asap.